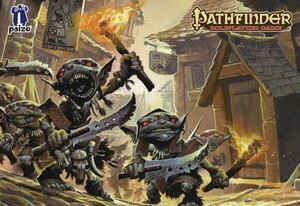 Goblins wreaking unrestricted havoc, with dog-slicer, fire and bomb. This SoundSet also features the famous Goblin Song, sung with the appalling inaccuracy that only Paizo Goblins can muster. This is a breakout SoundSet from the Pathfinder Adventure Path SoundPack. Goblin Battle SoundSet © 2014 Paizo Inc. Paizo Inc., the Paizo golem logo, Pathfinder, and Pathfinder Adventure Path are trademarks of Paizo Inc. Sounds created under license with Paizo Inc.